Leroo La Tau is situated on the western bank of the Boteti River, northwest of Khumaga Village and about 140 kilometres southeast of Maun. The eastern bank of the Boteti forms the boundary of the Makgadikgadi Pans National Park, which stretches away from the riverbank towards its interior of scrubland and mineral-rich grasslands. The lodge features twelve luxurious thatched and glass-fronted suites with en suite bathrooms, each unit raised on a wooden platform. The main lounge and dining area, with its inviting wooden and thatch finish, allows you to relax at the bar while listening to the wide variety of night sounds so characteristic of the African bush. Alternatively you can lounge around the swimming pool or enjoy the panoramic river view from the game-viewing hide built into the bank of the river. 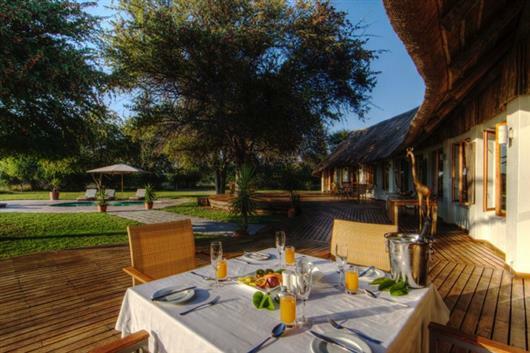 The lodge offers guided day and night game drives. Depending on the water level, boat activities are also provided. Optional cultural excursions can be arranged to Khumaga Village, as can guided nature walks in the area surrounding the lodge.